The recording received a 1979 Grammy Award for Best Rock Performance by a Duo or Group with Vocal. The song originated from an electric jam session between Glenn Frey and J. D. Souther who would visit Frey's home in Los Angeles whenever he was in town on tour. Frey and Souther wrote the first verse while listening to Sam Cooke songs. In the heat of jamming, Frey called Bob Seger on the phone and sang him the verse. Seger then blurted out the chorus. According to Frey, "J.D. [Souther], Don and I finished that song up. No heavy lyrics - the song is more of a romp - and that's what it was intended to be." The song was covered by country music singer John Anderson on the tribute album Common Thread: The Songs of the Eagles and was also covered by Michael Bublé on his album Crazy Love. The Haim sisters use the riff from "Heartache Tonight" at the beginning of their hit "The Wire" from 2013. (1983) "We Had It All"
"Heartache Tonight" was revived four years later in a cover version by country music artist Conway Twitty. Released as the second single from his Lost in the Feeling album, Twitty's version reached No. 6 on the Billboard Hot Country Singles chart in the fall of 1983. ^ "Ultratop.be – Eagles – Heartache Tonight" (in Dutch). Ultratop 50. ^ "Top RPM Singles: Issue 7853a." RPM. Library and Archives Canada. ^ "The Irish Charts – Search Results – Heartache Tonight". Irish Singles Chart. 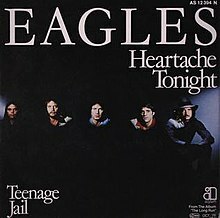 ^ "Dutchcharts.nl – Eagles – Heartache Tonight" (in Dutch). Single Top 100. ^ "Charts.nz – Eagles – Heartache Tonight". Top 40 Singles. ^ "Swisscharts.com – Eagles – Heartache Tonight". Swiss Singles Chart. ^ "Top 100 Singles (1979)". RPM. Retrieved 2017-11-11. ^ Whitburn, Joel (2004). The Billboard Book Of Top 40 Country Hits: 1944-2006, Second edition. Record Research. p. 363. ^ "Conway Twitty Chart History (Hot Country Songs)". Billboard. This page was last edited on 22 November 2018, at 19:20 (UTC).